Strokes occur when blood supply to a part of the brain is cut off, often in tandem with hypoxic ischemic encephalopathy (HIE), trauma, or both. After three minutes, cells begin to die, releasing cytokines which cause a ripple effect of damage spreading out from the area where blood flow was cut off. This can occur because of traumatic injury or blood clots. Treatment and rehabilitation must be immediate to prevent the spread of damage. Treatment can include IV fluids, blood thinners (to prevent a recurrent stroke), and prompt hypothermia treatment to slow down the damage and help the brain heal. The risk of pediatric stroke is highest in the newborn period – including during delivery. Very quick medical attention is critical after a stroke in order to help stave off permanent brain damage and conditions such as cerebral palsy. However, even with prompt recognition and management of a stroke, some babies still develop cerebral palsy. Often, cerebral palsy occurs when the baby is in distress and the physician doesn’t deliver her quickly enough by emergency cesarean (C-section) delivery. When a baby is showing signs of distress on the fetal heart monitor, it means she is being deprived of oxygen. A prolonged lack of oxygen in the baby’s brain can cause a brain injury called hypoxic ischemic encephalopathy (HIE), which often causes cerebral palsy. A stroke occurs when the blood supply to part of the brain is cut off. When brain tissue doesn’t receive adequate oxygen for more than three minutes, the process of cellular injury and death of the tissue begins. There are two types of strokes. A hemorrhagic stroke is when brain vessels rupture from trauma, which can be caused by the use of forceps or vacuum extractors during delivery. An ischemic stroke occurs when brain arteries are blocked by a clot, which can also happen from the use of forceps and vacuum extractors. Thousands of children suffered a stroke last year. A stroke diagnosis that is four or five days late is very harmful for a baby. Treatment of a stroke must be started right away, followed by rehabilitation to help ensure that more brain damage and complications do not occur. Doctors must quickly diagnose a stroke and give treatment to make sure the baby is has optimal circulation and is receiving enough oxygen in the brain. IV fluids and blood thinning medications should typically be given to reduce the risk of the baby having another stroke. When an initial stroke is not recognized or is misdiagnosed, the baby is at a higher risk of having another stroke, which also increases the risk of more brain damage and cerebral palsy. Strokes can also lead to seizures which are often difficult to recognize and can cause further brain injury. Babies at risk for strokes must be very closely monitored for seizures and other medical problems. Often, the only sign of a seizure is activity on an EEG. Ideally, babies who suffered a stroke should have continuous EEG monitoring. Several neonatal intensive care units (NICUs) around the country have the ability to easily perform continuous EEG monitoring. NICUs that do not have this ability should perform frequent – near continuous – EEG monitoring of a baby who had a stroke or is at risk of having a stroke. The baby should also be closely observed for signs of seizure activity. When seizures are occurring, they are causing injury to the brain, which is why they must be quickly recognized and treated. Seizures put a baby at a high risk of having permanent brain damage and cerebral palsy. Some of these signs aren’t noticed until well after treatment should have been given for the stroke, which is why early, close observation for signs of a stroke and early head imaging is imperative. It is crucial for babies who have had a stroke to immediately receive medications to help with blood circulation and perfusion. Sometimes supplemental oxygen is given or the baby might need to be placed on a breathing machine (ventilator), especially if the baby had to be resuscitated at birth and / or has lungs that aren’t fully developed. There are many events that can occur during or near the time of delivery that can cause the baby to have a stroke. It is very important for a mother and baby to be closely monitored during labor and delivery and doctors must act with skill and care in handling the following conditions. Hypoxic ischemic encephalopathy (HIE). This is when the baby suffers from a lack of oxygen in the brain. Trauma. Trauma can be caused by delivery devices that are used to help facilitate vaginal delivery. Inappropriate use of vacuum extractors and forceps can cause severe brain damage from contusions in the brain, stretching and tearing of blood vessels and brain tissue, brain bleeds and compression of the brain with changes in blood flow. Trauma can also cause the formation of blood clots inside blood vessels. In addition, the cumulative effect of prolonged periods of contractions and pushing frequently occur when the labor induction drugs Pitocin and Cytotec are used. Pitocin and Cytotec can cause hyperstimulation, a hypertonic uterus, and oxygen deprivation in the baby that gets progressively worse. Preeclampsia. This is when a pregnant woman develops high blood pressure around the 20th week of pregnancy. Preeclampsia can cause a decrease in blood flow from the placenta to the baby. Premature rupture of the membranes (PROM). This is when there is rupture of the membrane of the amniotic sac and chorion more than one hour before the onset of labor. A prolonged rupture of the membranes is when the amniotic sac is ruptured or leaking for more than 18 hours before the onset of labor. The longer the membranes are ruptured, the higher the chances that the unborn baby will become infected and the placenta will develop an infection called chorioamnionitis. Prenatal infections can lead to fetal stroke. Chorioamnionitis. This is an inflammation of the fetal membranes (amnion and chorion) due to a bacterial infection. When this infection occurs, treatment needs to begin immediately because the baby is at risk for meningitis, which can cause a stroke. Typically, antibiotics are administered and the baby is delivered immediately by cesarean (C-section) delivery. Gestational diabetes. Women with gestational diabetes are at a higher risk for having a macrosomic baby (baby’s weight is >4000 grams, about 8.8 pounds), which occurs because of the increased blood glucose and insulin levels, which stimulate fetal growth. When a baby is large, it may make vaginal delivery more difficult. This may prompt the physician to utilize a vacuum extractor or forceps for assistance in the delivery, which increases the likelihood of trauma to the baby. Gestational diabetes also may cause reduced uteroplacental perfusion (RUPP). RUPP is a serious condition that affects blood flow between the mother and baby. RUPP is a reduction in the flow of fluids, including blood, to and from the placenta. This leads to a condition called endothelial dysfunction, in which the flat cells that line the blood vessels are damaged, causing hardening and thickening of the arteries. The result is hypertension (abnormally high blood pressure) which is a life-threatening condition for both the mother and baby. Furthermore, RUPP can cause preeclampsia, another very serious condition. Placental abruption. Placental abruption occurs when the placenta separates from the uterus before the baby is delivered. The placenta delivers oxygen and nutrients to the baby prior to birth. A placental abruption can induce extreme bleeding, which can cause a severe reduction of blood flow to the baby’s brain. Fetomaternal hemorrhaging. This is profuse bleeding that causes the baby to be deprived of blood and oxygen, which can cause a stroke. Placental abruption and neonatal alloimmune thrombocytopenia (NAITP) are conditions that can cause fetomaternal hemorrhaging. Placental thrombosis. This is when there is intravascular coagulation (blood clotting) that occurs in the placenta and veins of the uterus. Research shows that hypoxic ischemic encephalopathy (HIE) and stroke often occur together. Hypoxic ischemic encephalopathy is a condition in which a lack of oxygen to the baby’s brain causes cell death and damage to the brain and spinal cord. This oxygen deprivation can be due to a lack of oxygen in the baby’s blood (hypoxemia / hypoxia) and / or a restricted blood supply (ischemia) in the brain. Hypoxic ischemic encephalopathy (HIE) often causes cerebral palsy. Hypothermia treatment (brain / body cooling) has been shown to be beneficial in reducing the risk of death and neurological impairments (such as cerebral palsy) in a baby who suffered a stroke and hypoxic ischemic encephalopathy (HIE). Hypothermia treatment for HIE is when the baby’s core body temperature is cooled down just a few degrees below normal body temperature. This is done either by use of a cooling cap or cooling blanket. Hypothermia treatment is given for 72 hours, and it must be given within 6 hours of the event that caused the stroke and HIE. The more severe the hypoxic / ischemic event and stroke, the sooner the treatment should be initiated. Hypothermia treatment halts almost every cellular process involved in the cycle of injury that occurs after stroke / hypoxic ischemic encephalopathy, and when the treatment is given, the brain injury is typically less severe, meaning that the child may have a less severe form of cerebral palsy or may even be free of cerebral palsy. MRI (magnetic resonance imaging). This is a test that uses magnets, radio waves, and computer technology to produce images of the brain. MRA (magnetic resonance angiography). This is an MRI of specific arteries in the brain. MRV (magnetic resonance venography). This is an MRI of specific veins in the brain. CT scan (computed tomography). This is a test that produces images of the brain using X-rays and a computer. CTA (computed tomography angiography). This is an X-ray of specific arteries in the brain. Cranial ultrasound. This utilizes high-frequency sound waves that bounce off organs and create an image of the brain. Lumbar puncture. This is a procedure that is performed to collect cerebrospinal fluid for diagnostic purposes. There are many medical conditions that can cause a neonatal stroke. When these or any risk factors are present, it is crucial for the physician to monitor the mother and baby very closely. The doctor and medical team must be skilled at quickly handling issues that arise during labor and delivery that can potentially deprive the baby of blood and oxygen and cause clotting and strokes. If the baby is showing signs of distress on the fetal heart monitor, the doctor must deliver her very quickly, usually by emergency C-section delivery. If you suspect that your baby was the victim of medical malpractice related to a stroke or hypoxic ischemic encephalopathy (HIE), call the birth injury lawyers at Reiter & Walsh ABC Law Centers. Our team has been helping children with pediatric strokes, HIE, cerebral palsy and birth injuries throughout the nation for over two decades. 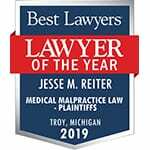 Jesse Reiter, the firm’s president, has been focusing on birth injury cases his entire legal career, and most of Jesse’s cases involve helping children who have cerebral palsy and hypoxic ischemic encephalopathy (HIE). When Jesse and his team of lawyers take a case, they spend a lot of time getting to know the child and family they are helping so they can fully understand the child’s needs. The Reiter & Walsh team has won many awards for their advocacy of children. Reiter & Walsh, P.C. and its attorneys have been recognized by U.S. News and World Report, Super Lawyers, The New York Times, Best Lawyers and other prestigious publications. Cerebral palsy and hypoxic ischemic encephalopathy (HIE) are difficult areas of law to pursue due to the complex nature of the disorders and the medical records that support them. To find out if you have a case, contact our firm to speak with an experienced lawyer. We handle cases all over the United States, in places including Pennsylvania, Tennessee, Mississippi, Texas, Wisconsin, Michigan, Ohio, Washington D.C., Arkansas, and more. Additionally, our team handles cases involving military hospitals and federally funded clinics. Watch a video of cerebral palsy lawyer Jesse Reiter discussing birth injuries, such as a stroke, that can occur when forceps or vacuum extractors are used to help with delivery. A stroke can cause hypoxic ischemic encephalopathy (HIE) and cerebral palsy. Ichord R. Stroke in the newborn. In: UpToDate. Dashe JF (Ed), UpToDate, Waltham, MA, 2014. Armstrong-Wells J, Johnston SC, Wu, YW, Sidney S & Fullerton HJ. “Prevalence and predictors of perinatal hemorrhagic stroke: results from the Kaiser Pediatric Stroke Study.” Pediatrics. 2009:123(3); 823-828. Golomb MR, MacGregor DL, Domi T, et al. “Presumed pre- or perinatal arterial ischemic stroke (Risk factors and outcomes).” Ann Neurol. 2001;50:163–168. Lynch JK, Nelson KB. “Epidemiology of perinatal stroke.” Curr Opin Pediatr. 2001;13: 499–505.